viaLibri ~ For Eldredge's The beginnings of San Francisco, the 47 California-themed printing blocks used to produce the volume’s illustrations. Francis, Walter, illus., et al. For Eldredge's The beginnings of San Francisco, the 47 California-themed printing blocks used to produce the volume’s illustrations. San Francisco: Pr. John C. Rankin Company (New York) 37 half-tone plates (on copper), 10 zinc cuts, all on their wood blocks; plus 3 additional plates on copper and another zinc cut, similarly mounted.. 1912 A full set of the printer's blocks prepared of the illustrations for Zoeth Skinner Eldredge's The Beginnings of San Francisco (1912), being 37 photographic half-tones on copper and 10 zinc cuts, all on wood blocks, ranging generally in size from approximately 2.5" square to 14" square, with oblong maps measuring up to 20" across. A number of the half-tones were done after drawings by Walter Francis, a California artist and illustrator who worked for the San Francisco Chronicle; a few blocks offer images of photographs, some identified as taken by W.C. Mendenhall of the U.S. Geological Survey or Captain D.D. Gaillard of the Boundary Commission; other images are said to be from paintings and a daguerrotype held privately, with another being the facsimile of a document in the John Carter Brown Library; and, indeed, some are simply "after" images in other books (e.g., The Annals of San Francisco and "Bartlett's Narrative"). 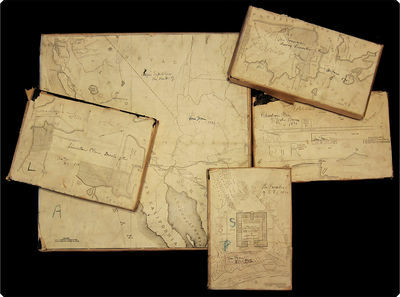 The images include a dozen California maps and plans; photographic views of the Colorado Desert and an artistic sketch of "the Trail on the Gila"; portraits of prominent early Californians; several "military moments" and a plan of the Presidio in 1820; plus, notably, scenic and historic "views" including renderings of "the Palo Alto," the ports of Monterey and San Diego, Yerba Buena, and a number of street and bay scenes depicting San Francisco proper. Eldredge was a New York–born banker and amateur historian of California whose Beginnings of San Francisco, though possibly self-published, is listed in Cowan & Cowan and described there as "of great historical value." In addition to the 47 images/blocks from that work present here, we offer four others that seem to be "related" but which we have not identified beyond establishing that they do not seem to be from the same author's History of California (1915). We must wonder, were they images prepared for the Beginnings and not used? The additional zinc-cut image of a document signed by Gaspar de Portola and two of the three additional half-tones on copper (Portola sighting San Francisco bay and the Spaniards marching to Monterey) were found as online images without clear attribution as to their physical sources; and the last, a western scene not identified, has not yet been "matched" at all. Most blocks from the Beginnings are still in or with => wrappers showing the images printed from them, as would have been convenient for the printers — these marked (as the backs of the blocks themselves sometimes are) identifying the images and/or showing that the work was completed. (The additional blocks are unwrapped and unmarked.) In sum, this => complete array of the blocks used for printing a substantial and well-regarded Titanic-era book looks like something that was put on a printing house shelf one afternoon in 1912 at the end of an ordinary project for the pressmen and simply stayed there. Seeing it in on its present PRB&M shelf, coherent and unmessed-with, is like walking up to that shelf just a little more than 100 years later. => Seeing it on its present PRB&M shelf, coherent and unmessed-with more than 100 years later, is like walking up to that shelf through one of time's “wrinkles.” The paper wrappers present are variously just fine or age-toned or browned, chipped, torn along folds. ALL the blocks are in good condition; this is not a sort of thing easily damaged!